During one of my regular trips to the local Goodwill store I found two pieces of furniture which I picked up for about fifteen dollars. Both pieces are actually made from repurposed or reclaimed materials which is an idea I really like and something I've been thinking about trying myself. The first piece is a shelf which by all appearances has always been a shelf but which at some point in its life aquired a set of wrought iron brackets and a new face which was an old window frame. 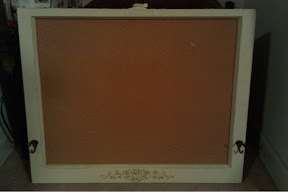 The second is a bulletin board made from yet another old window. With a pair of coat hooks one on either side. The cork is cracked but that's an easy and inexpensive fix. I'm actually thinking about replacing the cork with a thin board painted with chalk board paint but I'll decide that later. 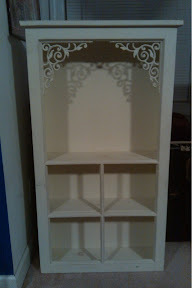 In the short term both pieces have suffered the same fate as my armoire. They've been commandeered, ok I volunteered them, to serve as decoration for my sister's wedding. That gives me about three weeks to get a replacement board and some paint. Both pieces are a cream color which I don't hate but I don't love it either and it doesn't match anything else I have so they will probably end up an antique white. And finally; I saw this gem on the tv guide yesterday and since we have a theme of sharing those moments where the powers that be feel it necessary to state the blindingly obvious I leave you with this. 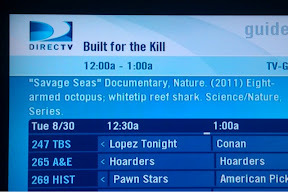 That's right folks no amputee octopi on this show. I'm pretty sure that's discrimination and a possible ADA violation. Shame on them.